Well, the two litters from Squeak and Pearl are ten weeks old today! Or, maybe, yesterday, by the time I actually hit “Publish”. Since meat rabbit fryers are generally processed between the ages of ten and twelve weeks, I wanted to get a good idea of how they were doing weight-wise. With your actual meat rabbit breeds producing ideally 5-pound fryers at that age, I was naturally hoping that we might be close to that weight. In reality, though, these are not actual meat rabbit breeds; they are the offspring of, initially, a minilop (hey, he was a rescue, you have to start somewhere!) and a Flemish giant cross that topped out a little over 6 pounds. Am I going to get 5-pound rabbits at 10-12 weeks from this line? Uh…. no. Pearl’s litter weighs 3 lb 1 oz, 3 lb 4 oz, 3 lb 5 oz, 3 lb 8 oz, 3 lb 9 oz, and 3 lb 4 oz. Their average weight is 3 pounds, 5 ounces. Squeak’s litter has been at the feed trough a little more. They weigh 3 lb 7 oz, 3 lb 8 oz, 3 lb 9 oz, 3 lb 4 oz, 4 lb 3 oz (! ), and 3 lb 15 oz. Their average weight is 3 pounds, 10 ounces. The little porker at 4 lb, 3 oz is the last bunny pictured in the post, “The two litters at 6 weeks!”. Fittingly, it is pigging out on food in the picture. One interesting thing about this is actually the fact that Squeak’s litter is heavier than Pearl’s. Squeak and Pinto both have Thumper, the minilop, as their father. Squeak is smaller than Pearl. I would expect Pearl’s litter to be heavier, since only the father, Pinto, is a minilop cross. With Squeak’s litter, both mother and father are minilop crosses. I suppose I will never understand rabbit genetics! The average for both litters is 3 pounds, 8 ounces. Not bad, considering these are just mutts with no meat rabbit background. :) Guess we’ll weigh again at 12 weeks and hope they’re close enough at that point. I really don’t want to butcher rabbits again that are old enough to have the skin thoroughly stuck to the meat! That was difficult! Okay, so I’m a bit late posting this. We prepared the rabbitry for winter quite a while back. Rabbits aren’t particularly sensitive to cold, and tend to prefer it to heat, but we do have to protect them from winter winds. We took some visqueen (heavy clear plastic sheeting) and wrapped the screen with it. Shay rolled it at the top and bottom to have enough to tack on. Then we took some leftover lattice and pulled it apart, stabbing our hands with staples several times, until we had a bunch of strips of wood. These Shay tacked on over the plastic to hold it to the rabbitry. The last thing to do was to cut the door back out so we could get in. The rabbitry during the spring, summer, and most of the fall. It is built of old window screens. Only the screen is covered. The space below it, for a few inches to the ground, as well as above it, to the roof, is still open for ventilation. The rabbits get no direct wind at all. It works really well. Shay just added a spring to the door so it doesn’t blow open when we are out there tending to the rabbits! The two litters at 6 weeks! The whole gang. As you can see, two white, two red (one broken), and two broken chestnut agouti. The one red, with swirls of lighter red, and white on the belly and feet. One of the whites. As you can see, there's a little grey on the nose. The other white. Okay, I confess. I have no idea if this is the other one or not. I can't tell the difference, and they were moving around too much! One of the broken agoutis. They look just like Pinto, their father! The other broken agouti. I couldn't get him to budge out of the corner. He was too busy washing his face. These guys are even more active than Pearl's! There's a chinchilla, a broken chinchilla, a half chinchilla/half light chestnut agouti, a broken red, and two bunnies I don't know the colors of. I really have no idea what this color is called, but it looks like cinnamon. It's like a red, but it's a bit darker, and looks like it could be agouti. I haven't blown into the fur to see. The broken chinchilla. Just really pretty. The half chinchilla/half light chestnut agouti. Very interesting combination. His fur is mussed because he just got stepped all over by several of his siblings. I guess they all wanted his spot. In the group shot, this is the bunny on the right with its back to you. There, it looks brown. Here, you can see it has a little bit of a reddish tint. Its sides are a difficult color to figure, too. Light brown/grey sort-of. Pretty little bun! Unfortunately, it is blind in one eye, because I didn't notice that its eye hadn't opened yet until too late. The chinchilla, a smaller version of her mother. A broken red, whose red fur has lighter and darker areas. Wish I could have gotten a better picture, but the little thing just wouldn't cooperate! They’re all mutts, but they’re pretty mutts! Mercifully, they lose the killer-cute looks right about the time they’re old enough to hit the freezer, as they start getting a more adult look to them. Broken chinchilla's face. There's a good body shot with airplane ears above. With two does, a buck, and a retired buck (too much of a gentleman with the ladies), as well as two growout cages (each containing a six-week-old meat rabbit litter), our rabbitry is bustling with activity. But there was one more empy cage — a third large brood doe cage. We were going to start shopping for a third brood doe soon, and we were going through the usual back-and-forth about what kind we would get. Do you get a good standard meat doe, bred for nice-sized litters that grow quickly on a reasonable amount of food, or do you go for a doe that can still be used as a meat doe, but is a little more colorful… sacrificing some of the efficiency? We talked of Creme d’Argents, Rex, and such… I looked at Thriantas and Palominos and so many more. But my uncle really wanted a New Zealand or a Californian. He has really gotten into this meat rabbit idea enthusiastically, and likes rabbit very much. He wants efficiency! About this time, Shay had met a lady through work who had a couple of pet rabbits. When she learned that we had rabbits, they got to talking. If I understand correctly, they had a number of other pets as well, and the rabbits were just a bit too much. So she offered the rabbits to Shay, understanding that they would join our meat rabbit herd, and that they would be loved as pets and live nice, long, comfortable lives producing fryers and roasters for us. Okay — back up a second — actually, at first, we only knew about one rabbit. Then, just a few days ago, somehow an “s” got tacked on to the end of “rabbit”. All this time, we never said anything to the kids, since you never know when unexpected circumstances are going to come up. We figured we’d just let it be a surprise. Then yesterday, the lady brought her rabbits. There were two of them, one large and one small. They had been housed together, and were already accustomed to being outdoors. Unfortunately, because of an appointment, I, my mom, and the kids missed meeting her, but we were on our way to Shay’s office as quickly as possible. He called me to let me know the rabbits had arrived. “One of them is white and has pink eyes. She’s HUGE!” No way… a New Zealand?!? Could this be any more perfect? “The other one is black, and a dwarf.” Oh, goodness… cute overload! Nibbles? A tiny black doe named Nibbles? I mean, can you get anything cuter than that? Okay, so she won’t be a meat brood doe, for sure, but the kids are probably going to cart her around like a little doll once she gets used to them. Nibbles will play cards, and watch them do schoolwork, and goodness knows what. So we arrived at the office, and Shay came walking over with an animal carrier I had prepared for him. The kids ran over and hugged him, and then realized what was in the carrier — BUNNIES!!! They were so excited, and the bunnies rode home between them. Fluffy is a sweet and curious doe who loves hay. As far as I can tell, she's a New Zealand White... perfect meat brood doe! Fluffy's been checking out her new surroundings. Nibbles is black with some silver tips on her guard hairs. She doesn't have the rounded-off nose that many dwarf rabbits have; I don't know exactly what she is, but it doesn't matter... she's adorable! We made a stop at Wal-Mart on the way home to get some rabbit food, since they’d been eating vegetables and Wal-Mart food in a green bag. So I bought some carrots and romaine lettuce, and went to check out the pet department. To my dismay, they no longer had Wal-Mart brand rabbit food in our store. Well, maybe she just meant a brand at Wal-Mart that is in a green bag. Okay… uh-oh… all of these rabbit foods are in green bags! What do I do now? I bought one, but quickly posted to RabbitTalk when we got home to find out what I should do. Meanwhile, we took the does out of the carrier, looked them over, and weighed them. And made sure they were does. Many a doe has turned out to be a buck later on! Fluffy weighed in at 7 pounds, 11 ounces, at 8 months of age. Nibbles is 6 months old, and 3 pounds, 3 ounces. It’s pretty comical seeing the two of them together. Nibbles makes Fluffy look positively gigantic! They are both very sweet, though they’re a little stand-offish right now. Before ILoveBunnies lifted Fluffy from the carrier, she was letting us scratch her head, rub her cheeks, and even rub her back. They should warm up pretty quickly. All of our bunnies get plenty of attention, so they should be part of the family before long! And by the time I am ready to breed Fluffy, she’ll be about 9.5 months old, a good age to start. Rather than feeding the food I got at Wal-Mart, which could just as easily be the wrong one as the right one, on the advice of my RabbitTalk friends, I am feeding them rolled oats mixed with a little bit of my pellets, along with carrots, romaine, and lots of hay. I’ll slowly increase the pellets so I don’t cause tummy troubles. Fluffy is very anxious to get more pellets. Right now, they have a foot guard thing so they can rest their feet and a chewing block. I’ll be getting some toys in there. I also need to get them a water bottle, instead of the dish they have right now. The dish sloshes every time they hop around, since our cages are suspended by chains. Just in case the family who gave us these two marvelous rabbits sees this, thank y’all so much for the bunnies! Finally, for the first time since mid-February, we have popples! For those of you who might not be familiar with the RabbitTalk forum at http://rabbittalk.com, a popple is a babby bunny. Someone on another forum observed that baby rabbits “pop” (make little jumps) like popcorn, and the nickname “popples” was born. It stuck at RabbitTalk, and we routinely refer to baby rabbits as popples, even though the proper name for them is kits. Anyway, here we are, trying to raise meat rabbits and be self-sufficient and all, and we haven’t had a litter of rabbits since February? What’s up with that? Right when the litter Pearl had in February was 10 weeks old, we moved. Then my husband Shay started looking for a job, and we started building a rabbitry. We completed the rabbitry and moved the bunnies in. Shay continued looking for a job, and we didn’t get around to butchering our first batch of rabbits until they were 24 weeks old. We mated Pearl to Thumper again, but it had been so long that she was unwilling, and she didn’t have any babies. We tried again, and Pearl was a little more cooperative, but it had been so hot that Thumper went heat sterile. So this is why we had all this delay. But finally, FINALLY, we have baby bunnies again! Rabbit does aren’t always good mothers the first time around, but Pearl had been perfect. So I was hoping that Squeak, who by this time had reached maturity, would be a good mother right from the start as well. I have not been disappointed! She had 6, all alive, active, and healthy, and just as squeaky as Squeak had been as a popple, which is where she got her name. She had them in the nestbox, in a nice nest of hay and lots of fur that she had pulled. Squeak's litter of 6 kits. Pearl’s first litter (of which Squeak was one) was 8, so I was crossing my fingers for 8 again. She had six. But that’s okay. We have 12 baby bunnies! Pearl again made a marvelous nest with an explosion of white fur in it. Her babies are so spoiled with that thick fluff she gave them! :) They need it, too… it went to freezing last night, and should get close again tonight. I can’t take the suspense!!!!! Thirty days ago, we bred our two does, Squeak and Pearl. We finally realized that Thumper, while a perfectly capable buck, was a little too much of a gentleman to get his job done. His son Pinto, however, was perfectly capable and also very assertive. So Pearl and Squeak were both bred to Pinto. Rabbits have a gestation period of about 30 days. I believe Pearl delivered her previous litter at 31 days (nearly a year ago). I checked the nest boxes this morning, and there were no baby bunnies out there yet. However, when Pearl flopped down to rest, I noticed that her belly seemed to be bulging quite a bit. Also, Squeak, who normally has this slender, jackrabbit-like figure, wasn’t looking so slender. So it looks like — just maybe — the heat sterility is over, and we should have baby bunnies in another day or two! It’s kinda hard to have rabbit meat when you aren’t getting any rabbits. A Change of Buck, & Baby Bunnies on the Way! … well, they should be, anyway, as long as the heat sterility business is over with! Our first rabbit is Thumper, who was abandoned and rescued. We bought our first doe, Pearl. Their first (and only, so far) litter gave us our other doe, Squeak, and a cute buck named Pinto. Pinto was not going to stay, because we already had our buck. But since he was our son’s favorite from that first litter, we promised he wouldn’t end up in the freezer. So we set about to find him a new home. We almost had one, but it fell through. Now it’s a good thing it didn’t work out. Since then, he and Squeak (our daughter’s favorite from the litter) have matured. They’re roughly 8 1/2 months old now. It was time to rebreed Pearl, since her mating five weeks ago produced no kits. It was quite hot this summer (quite regularly flirting with 100*), so I figure Thumper was heat sterile. I figured it was about time to breed Squeak as well. (The whole inbreeding thing isn’t as much of an issue for rabbits as long as you do not breed rabbits with undesirable traits. With meat rabbits, it’s even less important.) So Sunday I put Pearl in with Thumper, and, since Pinto is still here, I put Squeak in with him. Thumper did manage one successful mating with Pearl. He’s way too sweet for this job. When Pearl plays hard-to-get (which is pretty much all the time), he just starts grooming her. And he grooms her some more. And some more. Finally, he decides he’s finished, and saunters over to the other side of the cage and lies down. So now I’ve got two rabbits stretched out, relaxing, and not mating. Meanwhile, Pinto is being an assertive and very persistent young buck. Squeak’s not very happy, but Pinto has managed to mate successfully some three times with her. I finally had to take Pinto out of his cage in order to remove Squeak (who was so cross she gave me a light warning bite when I went to pick her up). Hmmmm…. maybe Pinto needs to stick around. So eight hours later, I mated the does again. Only this time, I mated them both with Pinto. I put Pearl in first, because she’s older, larger, and (I figured) more likely to give Pinto a problem. Well, she certainly didn’t make it easy for him, but his persistence paid off and he mated several times with her. Squeak ended up being the bigger problem, perhaps because this will be her first litter. She was pretty ticked off, but he managed several more matings with her as well, in spite of her. After another, slightly harder, warning bite from Squeak, I decided to just remove Pinto and let them stay in each other’s cages overnight. I am very pleased with Pinto. While he did bite the girls’ fur a little, he was mostly quite good with them, just very persistent. The girls did not appreciate the persistent part, to be sure. But I can’t just keep four rabbits with no return. I need for them to be productive. It’s only one day every couple of months or so that they have to be mad at me. Now, I can keep one rabbit with no return… Thumper is staying. We had already promised that he was here for good. And he is an excellent pet rabbit! So I guess there is some return. And he gave us Pinto, so that’s even better! So now that Pinto is staying, I don’t have to try to get a female Pinto for our son to keep. Bunny-Wan Kenobi is very happy. I finally got some good bunny pictures so you can see our rabbits. 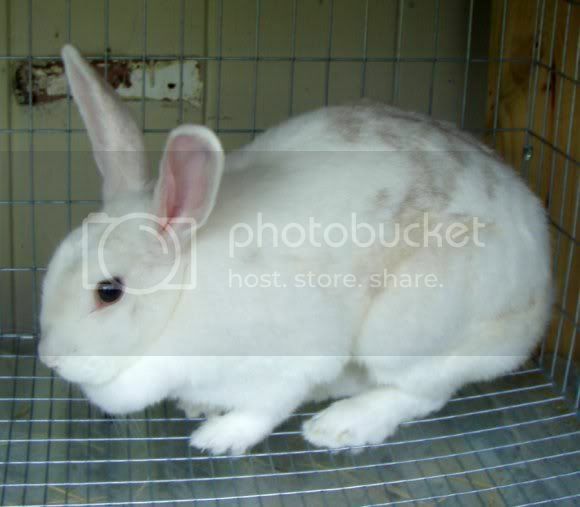 All of our working rabbits are in 24″x36″x18″ cages so they have room to stretch out and stand up. It also gives enough room for the does to raise their kits to a point. The first rabbit of our meat rabbit herd to come along was Thumper. He was abandoned by his family — set free outside. Many people think it’s humane and desirable to set a domesticated bunny free so they can roam wild and happy. Nice thoughts, but it doesn’t work that way. Usually, a freed domesticated rabbit will end up meeting a quick and painful end as prey for some dog, owl, or hawk. Those that don’t become prey establish feral colonies that then begin destroying people’s gardens and undermining their homes. Thumper managed to survive for a couple of weeks before Shay finally caught him. For a while, Shay thought he was a wild rabbit because of his coloring. It dawned on him one day, though, that wild rabbits don’t have lop ears! I think Thumper was a 2009 Easter bunny, given to a child for Easter and then set loose when the family moved. He is a very sweet bunny, and likes to be held, and loves, loves, LOVES to be petted. He is a minilop, I believe, though I have no real way of knowing. He grew after we acquired him, so that’s why I think he is now about 1 1/2 years old instead of older. Thumper is our daughter’s baby. 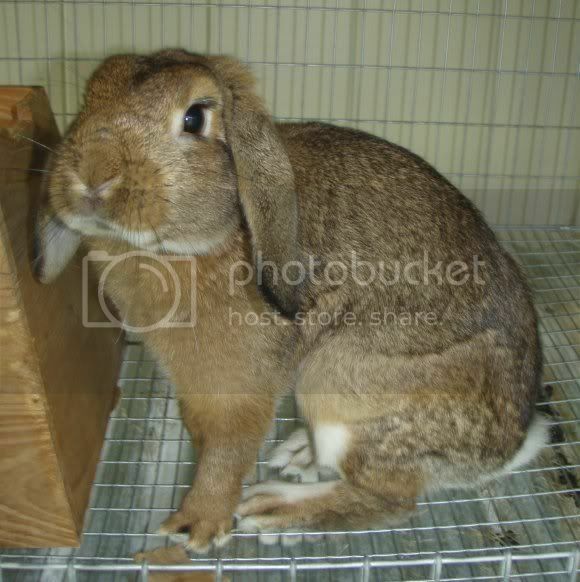 A little later, we went to Craigslist and found Pearl, a Flemish giant cross. Our son just fell in love with the picture of the black-eyed white doe. So off to the farm we went, and bought her. She’s not as friendly as Thumper, but still is a big sucker for having her head rubbed. Pretty good for a farm bunny. Our son spent hours sitting in front of her cage playing with the hay and petting Pearl, and she warmed up pretty well over time. She has given us one litter of 8 so far, and is hopefully on her second now (we’ll find out in a few weeks!). She raised her first litter very well, and we processed six of them a few weeks ago. They were a bit older than they should have been, but we didn’t have the chance to send them to freezer camp before that. Yes, her name is Squeak. She earned it early on, being the only popple in the nest that would start squeaking when you picked her up. She doesn’t squeak any more, though. Now if only she were built like her mother instead of her father. *sigh* Maybe she’ll produce like her mama! We will be breeding her (hopefully) for the first time this weekend. Pinto - young buck in need of a home. I had a lady lined up to take him, but she hasn’t responded in a while. Maybe we’ll find someone in 4-H. Or maybe you would like him. Come on… look at him! He’s terribly cute! I have told the kids that once we have our third doe, any of those four that dies will be replaced by a purchased or otherwise acquired rabbit that is more substantial for meat production. And, preferably, a purebreed, so that we can perhaps eventually show. So we’ve been looking at rabbit meat breeds that can still give us a color variety. Okay, maybe not. But we mated Pearl and Thumper today. I think Thumper succeeded in his attempts only once, so hopefully that’s enough! (And hopefully he isn’t heat sterile!) We’ll find out in a month. And by then, our other doe will be of breeding age. Yay! Thumper most definitely likes to mate, while Pearl most definitely does not. At least she has to put up with him only a few days out of the year. Maybe if he would just give her chocolates or flowers or something, she might be more receptive.